My colleagues and I were in Central around lunchtime and following our appointment we had a late lunch at Beef and Liberty in Lan Kwai Fong. On the menu were the usual burgers, along with one vegetarian featuring a patty made from beetroot, brown rice and kidney beans. There was also the Impossible Thai burger -- using a plant-based protein made to look like beef. Three of the four of us had beef burgers, while one went vegetarian and had not only the beetroot burger, but also the Impossible chilli cheese fries. It features the "meat" broken up and combined with kidney beans, Cheddar cheese, spring onions and sour cream. If you were given two plates of this dish, one featuring real beef and the other the Impossible beef, it would be very hard to identify which was which, not only in terms of appearance but also taste. When it's mixed in a flavourful sauce (and melted Cheddar helps too!) then the Impossible chilli cheese fries were just as good as real ground beef. But why eat meat if you don't have to or want to? Price-wise the real beef and Impossible version are the same price at HK$62. It's really a no brainer. 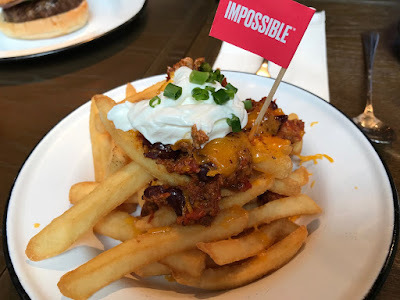 More and more hotels and restaurants in Hong Kong are embracing not only Impossible Foods' products, but also Beyond Meat, another "beef" protein substitute, and also Omnipork, that is supposed to mimic minced pork that can be steamed, stir-fried, deep-fried and wrapped in dumplings. It's great to see these establishments trying out these new products -- apparently people in Hong Kong eat more than three times the daily recommended amount of meat, the equivalent of two 10oz steaks per person. This is hardly unsustainable nor healthy. With alternative "meat" products on the market, we really need to try them out and even if it's one day a week or even one meal per day, it's better than nothing.